As the solar high season comes to a gradual close in most 4-season states, many of us are looking ahead at the next few months with a sense of foreboding and apprehension – buckle in, here come the dry months! Surely people aren’t thinking of solar anymore in the winter, it’s time to scale back and hibernate. But what if you could use the next few weeks to create a sense of urgency, line up a few key projects for Spring and get ready for next year’s growth? It’s not time to hibernate quite yet, solar pros! In fact, as your competitors prepare to call it a day, this is a great time to give a push and stand out from the crowd. Here are a few clever marketing tips to help you do just that. As with all sales, time is of the essence when it comes to selling solar. It’s been shown that the more time elapses between your initial quote and a homeowner’s decision-making, the lower your chances of closing the deal. So to create a sense of urgency, we suggest you think outside of the box and create limited-time offers that incentivize your prospective clients to get on board to enjoy exclusive pricing or additional perks. Here are a few creative ideas of what that promotion could look like. Early-bird specials! Book your solar installation for next Spring and get 15% off. End-of-season specials! Book your solar installation in the next 2 weeks and get 15% off. Book your solar installation in the next 7 days for 15% off! Book a consultation before October 1st and get a free rake! Book a consultation before October 31st and get a free shovel! The cherry on top? 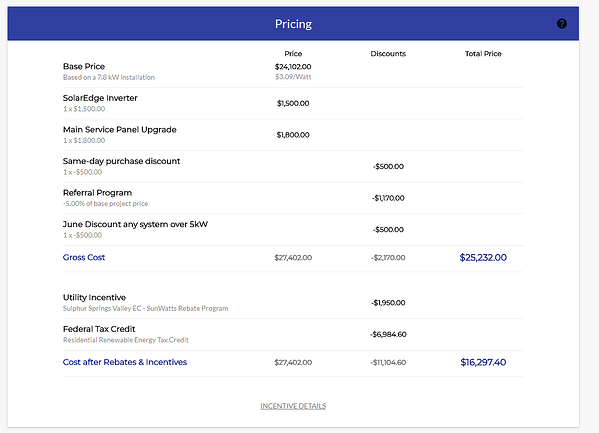 Solar CRMs like Solargraf make it easy to create and apply those incentives in just a few clicks. That means you can offer them to prospective buyers and show them their savings in real time, on the spot! Above is what a same-day purchase discount might look like on a Solargraf quote. Cheat sheet: Want to get the word out about your new promotion and make it look slick? Use a free online service like Canva to create attractive marketing material that helps you catch people’s eye. Trust us – free Canva templates makes it quick and easy, even if you don’t have any design experience at all! Think of it as your very own “Design for Dummies." When you’re in the thick of things, it can be hard to find time to reach out to customers and get their feedback. That’s why the end of the high season is a great time to put together a quick email and survey to hear their thoughts. That feedback is precious in two big ways. First, it helps you revisit your services and processes to see how you can implement change and improve for next season. Secondly – and perhaps even more importantly – it allows you to collect reviews and testimonials, which play a tremendous role in building up your company’s trust and credibility. In marketing, those testimonials are called “social proof”, and they’re proven to be one of the most powerful marketing tools you can use. In fact, studies have shown that 39% of consumers regularly read reviews to determine whether a local business is worth trusting. And 90% say reading a positive review has a powerful impact on their purchasing decisions. So before everyone hunkers down for the winter and forgets what a great experience they had with your company, reach out to hear their thoughts and start stocking up on key content for that website revamp you’ve been meaning to work on all summer. See? We practice what we preach! Cheat sheet: Not sure how to send a survey or testimonial request? Try a simple, drag-and-drop tool like SurveyMonkey or Google Forms. They’re free, easy to create and will notify you when you’ve received new answers. If you’re using a Solar CRM like Solargraf, you can even embed the link to your survey in your final invoice email, so customers receive it automatically every time a project comes to an end. While there may be value in doing it all yourself, we here at Solargraf are big believers in smart, strategic partnerships – that’s why we team up with industry giants like Nearmap, Eagleview and Loanpal to provide complementary services that help our users get the most out of their Solargraf experience. So try thinking creatively: is there anyone in your network that you could team up with to offer complementary home-related services that would allow you both to benefit from added visibility and momentum? Here are a few ideas. It may seem counter-intuitive to launch a new educational campaign about solar just as the season winds down, but it’s actually a great opportunity to provide content people actually want all the while reminding them of the benefits of solar all year round. After all, in most states, the sun doesn’t simply stop shining in the winter. As the end of the year arrives, you can also offer hindsight and data that might be harder to gather in the middle of the year. And as people prepare to take new years resolution, make big plans and take stock of their yearly finances, your helpful content might come at just the right time. Here are a few examples of articles prospective customers might be interested in reading. How much can solar save you in the winter? What new solar tax incentives are expected to kick off in the next calendar year? How can solar panels boost the market value of an average home in your city? How much has a home in your neighbourhood saved through solar in 2018? What’s the average timeline to break even on the cost of solar panels? How much solar energy could an average home in your city produce over a full year? Ok – so you’ve got great, limited-time offers, powerful testimonials, access to additional discounts for complementary services, and helpful information about the value of solar. Now it’s time to cast your net far and wide by reaching out to as many prospective customers as possible. Solar sales is a numbers game, after all. Those cold leads that stopped answering your calls and emails a few months ago? > Shoot them an email or drop them a line; you’ve got new offers and information they won’t want to miss. You’ve been on the fence about buying new leads or boosting your spend budget? > Now’s the time to give it a try or increase your spending – especially with Solargraf‘s 10% discount on all premium leads. Your great deals and carefully crafted content are sure to catch their eye and reel them in. Want to know more about how Solargraf can help you implement each of these tips and tricks?